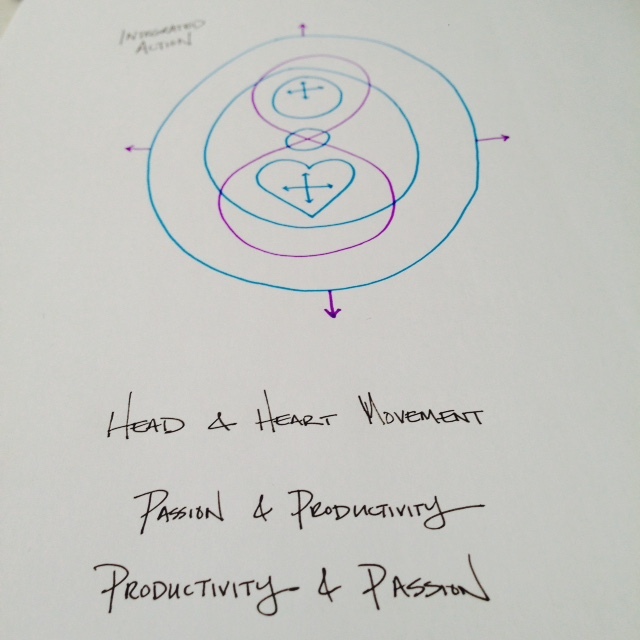 Golden Nugget Synopsis: If you’re a Head centric, linear, logical thinker and mover – TAP into your Heart more. 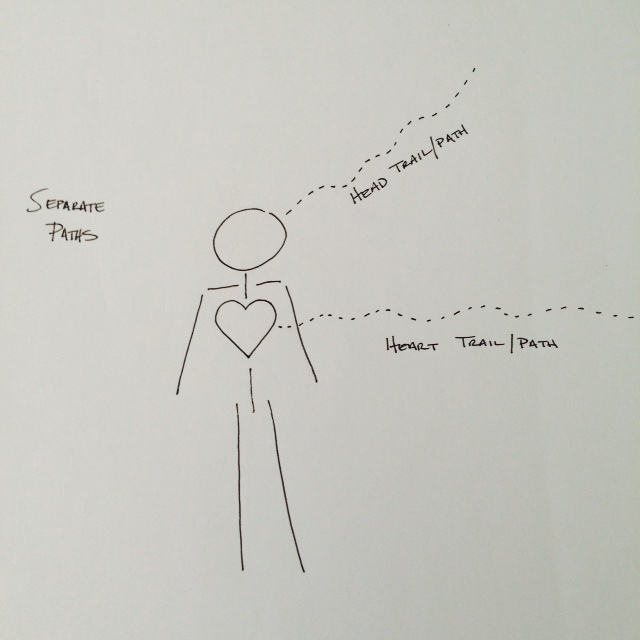 If you’re a Heart centric, passionate, creative feeler – TAP into your Head more. USE BOTH. Integrated Inspired Action. Passion, I understand it well. I can feel it in the depths of my gut. Can you feel it too? Do you know that space? With estimations like that, I’d block my creative and imaginative sparks. And so I shut down my pathways to passion. I listened to what I thought I heard, and just flipped a switch, continually. When feelings would come up, In my head it sounded like, that’s wrong, nobody else does that, you’re too different, What are you thinking!? I listened to that voice of authority from a young age. Over, and over, I just kept shoving my feelings down. It’s almost like I created this wall, a block. Ultimately, it became so heavy, that I began to feel nothing. However, I had no idea that was occurring. I was just kind of sad, and empty feeling, wondering, Where is my place in this world? When I asked that question, I never had an answer. I heard lots of other peoples answers, but nothing ever deeply resonated for me. So I’d search, and I’d look for it. I’d go places, I’d find something that maybe worked. Some of the easy stuff to find was food, tv, movies, music… That place, that space, made me feel Something. As the years of food, tv, movies, music wore out I realized a few things. The food was rapidly destroying my body, my movements, and my productivity in life. The tv, movies, music… those feelings that I felt there, they weren’t MY feelings, they were someone else’s experiences of the feelings I wish I could feel. They were tapping into that feeling space SO WELL that I could understand the translation of what they were trying to express. I became immersed in every story, every song, every relationship… Their story, their song, their relationships, their world became my world. My world has crashed a couple of times, in high school my world crashed with Leonardo DiCaprio & Kate Winslet on the TITANIC. I cried and cried and cried every time Rose promised Jack that her Heart would go on as he’s disappearing under the dark sea. I watched that movie 7 times in the theater. Other crashes involved parents, friends, relationships, jobs, dreams/frameworks dissolving. Sometimes the crash would strike me so hard the despair of grief was all I knew for quite some time. I have lived, STUCK, in grief/loss for many periods and years of my life. Those periods all stemmed from different happenings. It’s almost like I got stuck in time, and reality kept moving forward without me. In my mind, I titled all of these moments. As I look back now I can see the instant separation that I was creating between myself and others. I saw these moments as separate wheels, and that I was somehow stuck or lost on the outside. What I can see now, is that really, all of these moments, were expansions of the same wheel. I was always on the inside, I was always expanding with that wheel. If my feelings weren’t shoved so far down, I might’ve been able to feel it that way, too. The problem was, I didn’t see it that way, and so I ran with that perception. Exercise your routes… The pathways. Do you see the different paths in your life? From what I’ve learned, people have different set operation points, where they just have natural tendencies. Some people operate naturally out of their heads. They’re logical, realistic thinkers, linear, and seemingly very business savvy. Other people operate naturally out of their hearts. They tend to be passionate, artistic, creative, and big dreamers. I used to think, life was all about Passion, if you didn’t have passion, you weren’t really living your life, you were just going through the motions. But, now I see that someone who can operate through the motions, the natural steps and progressions of life, productively… Such as having a 9-5, setting up budgets, paying all your bills on time, having a 401k set aside, strategies of life. It’s super important to acknowledge and be aware of. I always felt like someone who operated in this way, lacked passion. Let’s call these two operation points Productivity and Passion. We’ll relate Productive Actions to Head and Passionate Actions to Heart. Tunnel vision pathways, unaware of your surroundings, or other incorporating opportunities. Integration. Utilizing BOTH operation points to create actualization. How do YOU do that? Really, how do YOU do it? I want to know. Head & Heart Movement. When you OPERATE in this way, your Footsteps are the Integrated Actualized Pathway. Passion without Productivity is the same as Productivity without Passion. Now, One is not better than the other, for we ALL have both parts. What you do need to recognize is which path comes more naturally to you. This is an important recognition to utilize as you’re dreaming and setting goals. To read more about my blog on Dreams & Setting Goals CLICK HERE. For me, I tap into my Heart/Passion space easiest, I can be overly emotional, easily excited, and highly passionate. I can see the possibility for something and just JUMP for it. But the space where I need to take a pause is through my Head. It is of the most benefit to then filter an idea through a more realistic, logical lens. Sometimes when I miss taking this step I set myself up for a nose dive. The same could be true about someone who operates most naturally out of their head. They come up with great strategies. Business plans, meetings, numbers, all very logical. But if they don’t pass through their Heart they’ll be missing the passion portion, whatever they do set up, may not feel as fulfilling. Maybe this is where Conscious Integration comes in. 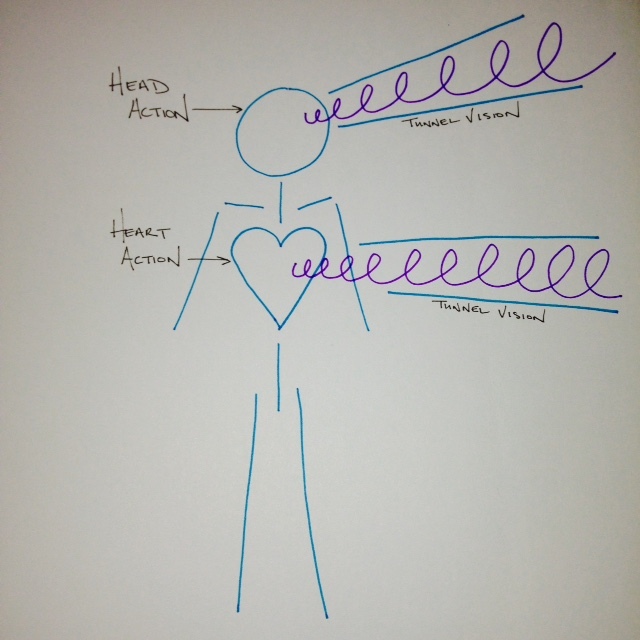 Know which pathway you naturally move through easiest (Head or Heart), then make a very concerted attempt to also pass through the other (Heart or Head). Checks and Balances. When you operate like this your goal setting and achieving will become much more precise. As I start observing my movements and actions in life, I set out a goal, and I just pay attention to how I operate day to day. One of my main goals right now is to continue to cultivate my writing. What I’ve noticed in doing this is that the writing can come from different spaces. Generally, I can write out of my Head OR my Heart, but sometimes it’s tough to switch from one to another. And a lot of times I get stuck. The hard part is when I’m stuck, I don’t realize it, I just notice myself getting frustrated about what is, or is not, occurring. When I notice the frustration is when I realize that I need to step into a different zone. So I try to open a new pathway to my head, or my heart, depending on wherever I am at in the moment. It usually entails a completely different activity than sitting down and ‘writing’. Some of my greatest pieces have come in the midst of walking outside in nature. It is always very encouraging to notice the creative spontaneous ideas just arise! So, try it. Notice where you are. Are you in your Heart? Are you in your Head?Now move, try another avenue. Attempting this will lead you to further routes of Self Actualization. Where you’ll see the fulfillment of your Heart adding value to the world/life through avenues that are realistic, logical, and productive, through your Head. It IS the whole picture. If you’re interested in some great pointers on how to apply this effectively check out: Getting Things Done® by David Allen. He has administered a 5 Step Approach to Being Productive. Allen’s Ted Talk explains all of this in the most eloquent and simple way. Watch it and be ready to be inspired. You can check that out Here. Also, a big thanks to Lewis Howes and The School of Greatness for hosting David Allen in Podcast 145. You can read about that and listen to that Here. While much of this blog post was written before the discovery of this podcast, I felt such a deep connection to it, that I thought sharing it’s principles and philosophy would be the greatest next step. I hope you enjoy the blog post. If you have any comments or want to start a private conversation about these topics please email me at FosteringFitnessNow @ gmail.com.